Following the tragic death of his wife, Alan White and his two children find themselves plagued by a series of inexplicable events that eventually force them to leave their home and move into an apartment building in the city. Worryingly, within a week of moving, they once again begin to experience the strange phenomena that threaten to tear apart what is left of their family. Desperate for answers and, hopefully, a release from what he is beginning to believe is a haunting, Alan requests the help of a small team of parapsychologists experienced in investigating and explaining such incidents. Armed with an arsenal of state-of-the-art technology, the team members set up their equipment and begin a vigil during which they will attempt to solve the mystery. But what they uncover proves to be unlike anything they have ever encountered before. After 3 Paranormal Activity films and a string of similarly themed imitators, do we really need another found footage story of malevolent hauntings? Probably not, but word on the horror grapevine is that Apartment 143, which was written by Buried and Red Lights director Rodrigo Cortes and directed by first-timer Carles Torrens, is better than most. And this is one time when Momentum's habit of changing film titles for DVD release could actually be a good idea, as the original title – Emergo – was also the name of the skeleton that William Castle trundled over the heads of unsuspecting audiences during screenings of his 1959 The House on Haunted Hill. 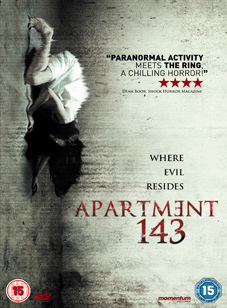 Apartment 143 will be released on UK DVD on 15th October 2012 by Momentum Pictures at the RRP of £12.99.